As with any seafood recipe freshness is paramount. If you catch your own flounder, kill it as soon as the fish is landed and put in on ice. Clean all flatfish species as soon as practical and store in the refrigerator. Cleaning fish in seawater is best, if unavailable add salt to the water used for rinsing the fish, fresh water removes some of the delicate flavor of fish and should not be used. If handled and cleaned correctly the fish will stay fresh for a week. The key to cooking flounder in a pan lies in preventing the skin sticking to the pan as this can cause the fish to break up. Sticking is caused by excess moisture turning to steam and breaking up the skin. There are several ways of minimizing the risk. Teflon coated frying pans can reduce sticking as can frying paper, (a high temperature, grease proof paper placed between the food and the pan). Paul uses a stainless electric frying pan, which is very prone to sticking, but rarely has the problem because of the pre cooking preparation he does. For flounder with a crispy skin and moist succulent flesh, do the following. Dry the flounder thoroughly with paper towels - use two pieces of paper per fish. Be sure any liquid in the gut cavity is also removed. Rub the flour in firmly with the palm of your hand until all areas are covered and dry. Remove any excess. Melt butter and olive oil - at about a tablespoon of each per fish - in the pan. If you don’t want to use butter, margarine can be substituted. When the pan is hot, place the fish in with the underside down. Use a metal spatula for turning the fish over, preferably the barbeque type with a sharp leading edge. Then if the fish should stick to the pan it can be more easily released. This dish is delicious as is, however for those needing a bit more zing with their fish, lemon juice, the spicy vinegar from pickled onions or balsamic vinegar sprinkled over the fish will add a variety of complementary tastes. A great accompaniment to fried flounder is lightly buttered bread fried in the same pan the flounder was cooked in. The bread absorbs all the flavors and juices left by the flounder. This is the thinnest fish batter you can make, when deep fried in hot oil of 350-375 Fahrenheit (180-190 Centigrade) it will be crispy - and so thin it is transparent! You will need two eggs, a cup of corn flour and salt and pepper seasonings. A deep fryer or deep frying pan capable of safely holding enough hot oil to cover the fish is required. Use canola oil or other high tempreature vegetable oil for the best results. The most important thing is to ensure the fish is as dry as possibe before applying the tempura batter. If it is wet the batter will become soggy after cooking and will detach from the fish during serving. Lightly beat two egg whites in a deep bowl until they break up and become evenly fluid. Put one cup of corn flour in a shallow tray. Allow about three minutes frying time for small flounder and a little extra for larger or fatter fish. Place the dry flounder on a microwave dish. Lightly spread or brush butter (or margarine or olive oil) mixed with salt and pepper over both sides of the fish. Cover and cook on high for two to three minutes. Garnish with parsley or lemon. This flounder recipe also turns out well with basalmic vinegar mixed with the basting oil. Dry the flounder. Lightly spread or brush butter (or margarine or olive oil) mixed with salt and pepper over both sides of the fish or use basalmic vinegar mixed with the basting oil. Place under a hot grill for three to four minutes, then turn and grill the other side. Test with a knife in the thickest part to check the flesh near the backbone is properly cooked. If it is white it is done. Cleaning flounder is simple, cut behind the pectoral fin on the underside of the flatfish down to the outside of the gut cavity to the vent. Reach in with a finger and scoop out the viscera but leave the roe intact. Remove the gills by pinching or snipping them off through the gill slits. 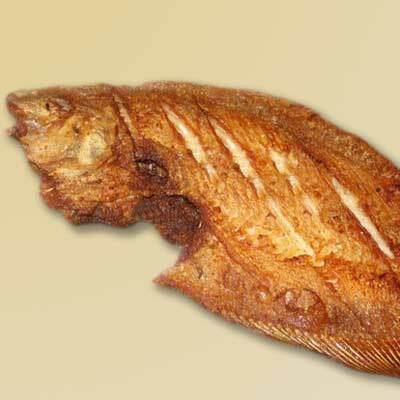 Removing the gills extends the shelf life of flatfish and is more appetizing to the eye, if left in the surrounding flesh will be tainted by the strong taste of the gills. Rinse in saltwater. If purchasing flounder from a fish shop always check the eyes are full and protruding, they should look clean and be clear and moist. Fresh flounder recipes turn out best, the skin and fins of the flounder should also be moist and smooth, if the skin is wrinkled the flesh will be dehydrated or the fish is nearly spoiled. In New Zealand most flounders are cooked whole with the skin on. 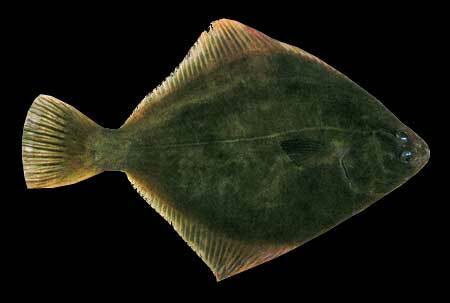 Scaling or skinning flounder is not necessary for sand, yellowbelly or green back flounder. However, the less common species such as brill, sole and turbot and are frequently filleted. The best parts of a flounder to eat is the fillet on the opposite side to the gut because the skeleton of flounder on this side is flat and the flesh is easy to remove without the risk of small bones. The taste of flounder varies according to where it is caught. Flatfish taken from clear ocean beaches taste the sweetest while those taken from harbours can have a slightly muddy taste. Estuarine flounder taken from brackish or almost fresh water can taste quite muddy. As a general rule the muddier the water the more muddy the taste. In New Zealand we have several types of flat fish, all are in demand because of their delicate texture and excellent flavor. The species most commonly marketed are yellow belly and green back which grows up to 20 inches long and is taken mainly from mud flats and estuaries. Flatfish are found from shallow to deep water either in harbors or off the open coast. Thirteen species of flat fish are found in New Zealand waters including flounder, soles, turbots, and megrims. Sole are easily recognized because the fins run almost all the way around the body. Turbot are the largest and also have a thick body and fine scales. Megrim flounders are very thin in the body, which makes it unsuitable for market. The megrim is especially abundant in the big lagoon at the Chatham Islands.